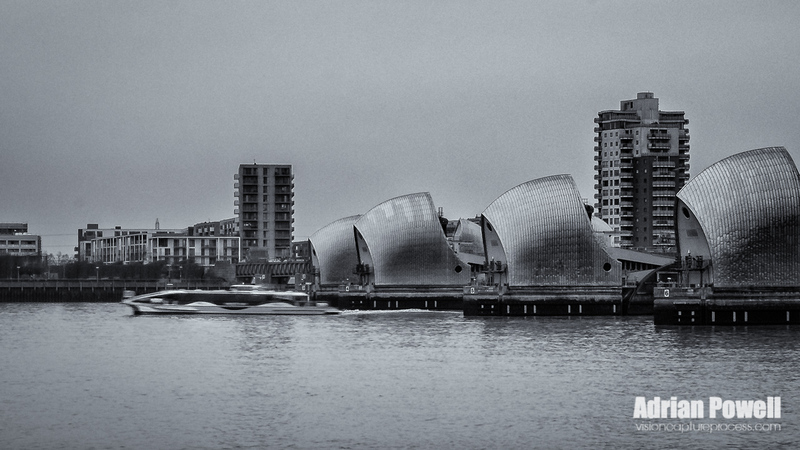 The Thames Barrier – revisited! This time from the south side of the River Thames and with a Thames Clipper travelling from Woolwich towards the O2/Millennium Dome, and the City of London – I like the contrast between the static barrier and buildings with the movement of the boat. I had stayed the previous night in the Ibis Budget hotel near City Airport – I left the hotel and walked down to Woolwich Ferry on the north side of the Thames (after a detour because of CrossRail building works), took the foot tunnel (similar to the foot tunnel at Greenwich…but longer) and then along the Thames Path. Eventually, I got to the O2 Arena at North Greenwich. I then took the Jubilee Line Underground to Canary Wharf. It was a long walk – I measured it to be a little under 5 miles (with the detour)…just as well I set off early (I left the hotel at 07:15 as it was getting light)…got into the office just after 09:00. The day wasn’t great – it wasn’t raining, but there was thick cloud resulting in a rather bland sky – however, while walking along, there were photographic opportunities…if only for scoping out locations to come back to another day. As the sky was bland, shots taken lend themselves to being converted to black and white, as I have done here. Initially processed in Lightroom to lower the highlights and lift the shadows a little – I used a graduated filter to pull back more of the sky, then cropped (quite a lot here as I felt the shot was too wide out of the camera) and sharpened slightly. Black and White conversion was done in SilverFX Pro – boosting the structure and contrast and applying a light selenium tone.